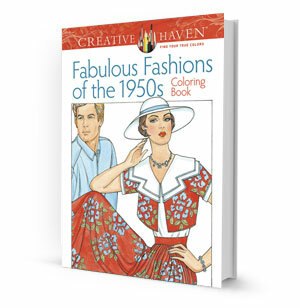 Step back in time with these 31 beautifully illustrated pages of styles from the 1950s, perfect for adult coloring. Add vibrant color to a terrific variety of outfits, from full skirts that accentuate tiny waistlines to cardigans and capri pants as well as men's attire for both business and casual wear. Illustrations are printed on one side of the perforated pages for easy removal and display.